I didn't know what I was doing. Oh, I thought I knew. I thought I was translating a rulebook for my friend Vláďa, but actually I was working on a game that would be Czech Games Edition's best-selling title and on a rulebook that would set the tone for what players expect from CGE. The year was 2007, and Vlaada Chvátil had this game called "Rakety". That's Czech, but you can probably tell that it means "Rockets". It was a silly game about building spaceships that got hit by meteors and fell apart. I had never played it. It sounds crazy, but ignorance of a game can be an advantage when I am translating. It means I have to understand the game only from the rules, which makes it easy to spot places where a new player would have questions. Nowadays, I get this information from the players themselves. Before I start a rulebook, I have explained it to other players at least half a dozen times. That gives me a chance to try different ways of presenting the game, and I can discover what works. And that's the knowledge that Vlaada had when he sent me the Czech rules for Galaxy Trucker. At the time, I didn't realize that his approach was unusual, but Dave Howell has pointed out to me that it is pedagogically amazing: Vlaada tells you how to build your ship, then he says, "Go ahead and build it!" Then he sends you out on a flight in which the deck is stacked so that you will encounter exactly one of each type of adventure. By the end of the first round, you have learned the basic rules of the game. But Vlaada's games never stop at the basic rules, do they? There's always some little tweak that makes the game more fair, more interesting, more gamey. That's why you're allowed to look at 75% of the cards during building. Any less, and you couldn't make strategic decisions. Any more, and you would miss out on the spine-chilling consequences of flying through a sideways meteor shower when all your cannons point to the front. His approach to explaining Galaxy Trucker was to make sure the players understood the basic rules, and only then would he explain all the little tweaks that turned a good idea into a solid game. After working on a dozen more projects for CGE, I would eventually realize that a rulebook needs to do two very different things. When the game comes out of the box, the rules need to tell you how to play it; while you're playing the game, the rulebook needs to answer any questions you might have. 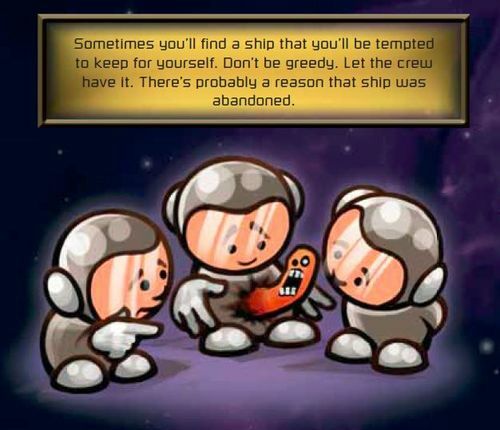 The Galaxy Trucker rulebook focuses heavily on the first thing. It's designed to be read linearly. 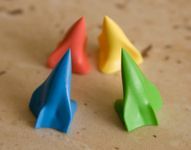 If you want to look up a rule — about set-up, about the flight, about giving up on a flight — you have to remember whether it's a basic rule or one of those tweaks that Vlaada didn't mention until after your first flight. That can be inconvenient. If I were in charge of making this rulebook now, knowing all the things I have learned in the last ten years, I would do some things differently — and I would be completely wrong because the rulebook Vlaada wrote is the ideal rulebook for this game. The rulebook is not just funny; it's funny for good reasons. The jokes are telling you how to respond to the game. They say, "Your ship will blow up. Don't take it seriously." And the jokes reward people who read the whole thing straight through. "Now, you are probably expecting us to say you want as many shields as possible. Of course not. You only need two shield generators. In fact, if you are gutsy (or suicidal) you can fly without any shields at all." The humor is what made this rulebook stick in people's minds ten years ago. Paul Grogan (Gaming Rules!) told me it was a big part of what made him want to work with CGE. And it was a great reward for people who were taking the time to learn the rules. However, Vlaada also took steps to avoid punishing people who need to look up a rule during play. Much of the humor is written as excerpts from "The Trucker's Guide to the Galaxy". These excerpts are confined to convenient yellow boxes that you can ignore if you are looking for a rule or read if you just want to skip to the funny bits. My job, of course, was to take these funny bits and make them funny in English. I guess I did okay. The original rules are so funny that some Czech players have literally exploded with laughter, and the Czech government has been forced to classify the Galaxy Trucker rulebook as a controlled substance, but we got some positive reviews in English, too. This translation taught me a lot about writing humor. It wasn't enough to just translate the meaning. I had to translate the timing. Honestly, I failed. Czech and English don't have the same rhythms, and Czech has a much looser approach to word order. Yeah, word order. That's important. Because when you're telling a joke, the punch line has to come last. So in most cases, I translated the idea of the joke, then played with the English words until it was funny again. Anyway, I assume you're reading this designer diary so that you can hear about the sordid squabbles we had during game production, so let me tell you about the great meteor controversy. Meteors are shooting stars. That is, they occur only in an atmosphere. A lot of people think that a meteor is the big rock that burns up and makes a shooting star, but the big rock is actually called a "meteoroid". If there is no incandescent ablation, there is no meteor. "Meteoroids" would have been a stupid name for the card and "Meteor Shower" is something that can happen only in atmosphere, so I was convinced the card should be called "Asteroids". Vlaada was dead set against that because asteroids are huge, much larger than a spaceship. We finally compromised on "Meteoric Swarm". Honestly, I was taking the technical terms much too seriously. We changed it to "Meteor Swarm" in the app. It doesn't matter that the technical term is "meteoroid". "Meteor" is just a better name. Eventually, Vlaada confessed to me that he really wanted to call it The Trucker's Guide to the Galaxy — sort of like "The Hitchhiker's Guide to the Galaxy" but from the other point-of-view. The yellow-box jokes in the rulebook were very much inspired by Douglas Adams, so we decided that The Trucker's Guide to the Galaxy would be a good title for the rulebook. However, the game itself needed something punchier. 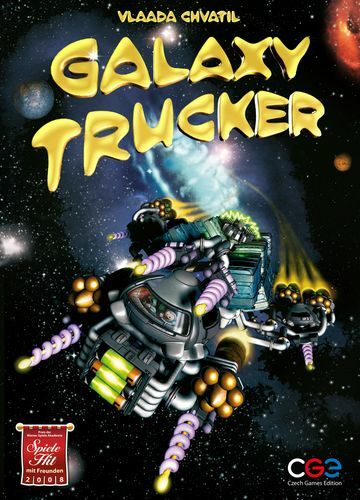 And so (after a few tense hours when it looked like we were going to mess the whole thing up and name it "Galactic Trucker") the Galaxy Trucker name was born. CGE had good success with Galaxy Trucker right out of the starting gate, and the game continued to find new players, inspiring many expansions and eventually leading to the creation of CGE digital. For me, it was the beginning of a career working on rulebooks that are imaginative and engaging. 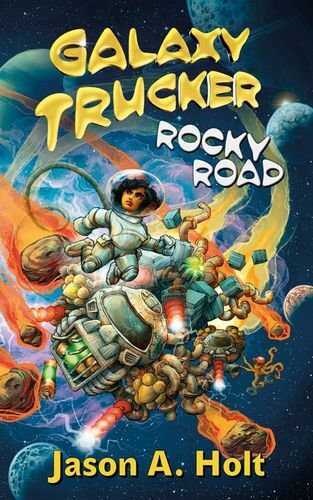 It also gave me the chance to write voices for Vlaada's funny characters in the digital app, and it inspired my first science fiction novel, Galaxy Trucker: Rocky Road. I told you Galaxy Trucker became CGE's best-selling game, but you probably know that status wasn't true after 2015. In that year Codenames rocketed past Galaxy Trucker's fame, and that game has established itself as CGE's brightest star — but Galaxy Trucker is the game that hauled CGE to the Codenames launch point. And ten years later, like the Little Rocket Engine That Could, Galaxy Trucker keeps on trucking.